Those pesky insects that drive you crazy when you try to spend time outdoors on a warm summer evening also attack other animals, including reptiles. Often drawn to warm-blooded animals such as mammals and birds, mosquitoes are opportunistic bloodsuckers and won't turn down a cold-blooded drink when it's convenient. You might think a mosquito got a tasty meal off you while you got a giant, itchy welt in return, but the insect isn't drinking your blood for nourishment. 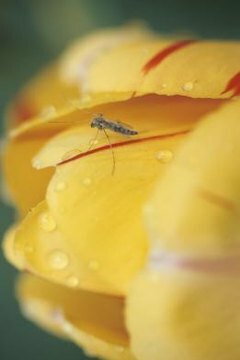 Mosquitoes, both male and female, survive on the sugary nectar of flowers for nourishment, as well as sweet saps or other plant liquids. Only female mosquitoes drink blood. They use its iron and protein to nourish their eggs before laying them; blood is essential in a mosquito's reproductive process, but not as food for adults. Although some species prefer certain types of animals, such as livestock, many search for the first available creature. A female mosquito's mouthparts, or proboscis, saws through even the tough skin of reptiles and slides between snake scales. Mosquitoes only live for a few weeks, but during that time they can cause plenty of damage. According to National Geographic, mosquitoes cause millions of human deaths each year by spreading disease. They inject saliva with a clot-reducing enzyme while they're sucking blood, making the blood flow more easily. This injects any bacteria, viruses or parasites that the mosquitoes picked up from their last victim into their new victims. Many of these diseases and parasites are transferred between species, which means mosquitoes can bring disease from one group of animals to another. Galapagos Islands researchers are increasingly worried about this phenomenon due to a rise in mosquito populations: a mosquito who bites a tourist with an infectious disease could transfer it to the local reptile population. Mosquitoes run a big risk by drinking blood from reptiles, but that doesn't stop them. Many reptiles, such as several species of lizard, enjoy a tasty meal of mosquitoes—as the insects buzz close enough to land, the reptiles snap up the tiny morsel. Amphibians such as frogs and toads also eat mosquitoes, as do several species of birds and fish.